In 2016, Brad Cole Construction Company received one of the most coveted awards in the construction industry, the Southern Company Triangle Safety Award for the tenth consecutive year. Since 2007, Brad Cole has been recognized with this award annually, an achievement that no other contractor has attained. 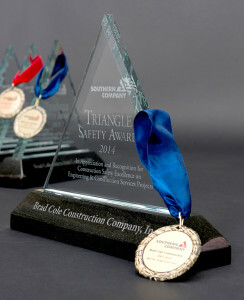 The Southern Company Triangle Award is earned annually by a few select contractors that meet the criteria of 100,000 work hours performed on Southern Company projects during the year, sustained no lost time due to injuries, achieved a Recordable Incident Rate below Southern Company goal, and caused no interruption of Southern Company production and operations as a result of their work. 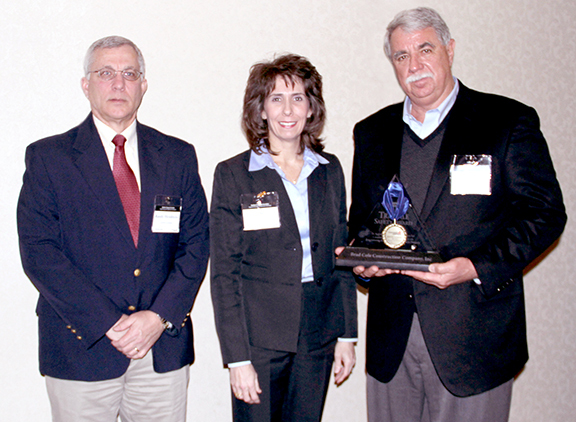 The award was received by Brad Cole, President and Founder, during the annual Southern Company Safety Banquet. “We have a culture of safety that we have purposefully and carefully cultivated since our beginnings as a company,” said Cole. “It is a real honor to be recognized by Southern Company, now the eighth year in a row, for our focus and diligence in implementing safety protocols throughout the company.” Cole also credits some of the key methods of practices in the company including Target Zero, STEP Observation Practice, and Daily JSA and Toolbox Talks for their success in achieving the unusually high safety record. Paula M. Marino, Southern Company, Senior Vice President of Engineering & Construction Services; and Brad Cole, President of Brad Cole Construction.